All parts of Africa and southern Asia from Turkey to China. Body length: 4'. Shoulder height: 28". Tail: 3' long. Weight: 80 to 175lbs. The leopard is unusually varied both in the color of its coat and its size. Its base color is tawny yellow, whitish on the under-parts, with many small black spots arranged in rosettes on its body. The spotted tail is very long and often up curled at the black tip. Always shy and wary, with keen senses, the leopard's ability to hide makes it harder to track down than a lion or tiger. It is mainly solitary and is nocturnal in areas disturbed by man, elsewhere it is crepuscular(active at twilight). Where it is nocturnal, especially in the heat of the day the leopard lies up in a "day-bed" in thick undergrowth. 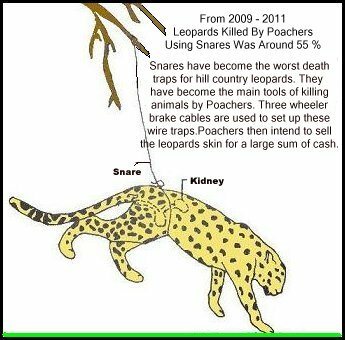 The leopard obtains its prey by stealth, ambush or dropping on to it from a tree. It usually seizes the neck of its prey with its teeth, fracturing the cervical vertebrae, then drags the carcass to a quiet spot to begin eating. If the prey is too large to consume in one meal, it will drag the kill into a tree for safe keeping. It is an excellent climber. Being a large, elegant and robust animal, it is very powerful and can carry over 200 pounds into a tree. It can run 35 mph, leap 10' high and 15' across. 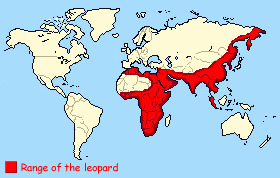 The leopard is usually silent in settled areas. In undisturbed areas it frequently utters a harshly grating cough repeated several times in rapid succession. The female is sometimes vocal when searching for a mate, but the male may give a coughing roar at any time, probably to establish territory. In the wild, mating seems to take place at all times of the year. Gestation is 90 to 105 days. Two or three cubs are born in a cave or rock crevice. The cub's coat is dark, woolly, with indistinctive spots, and longer than the adult's. It stays with the mother until 18 months old. The young become sexually mature at 3 years.There is an estimated 300,000 Leopards in the World. All types of animals. Medium-sized and small antelopes, young of large animals, babboons, game birds, cane rats, hyrax and various small animals. Predators Man- poaching for hides and because of their threat to domestic livestock.The Leopard likes to drink daily to like other animals but can go as long as a month without water. LEOPARD & MAN The leopard has been hunted for it`s pelts for many years.In the early 60`s leopard poaching reached an all - time high when an estimated 50,000 leopards were killed in East Africa.Today the leopard is a protected species,but it is still hunted by hearsmen,shepherds, and poachers.But it is recognized by farmers as having a useful function: It controls such animals as baboons and bushpigs that damage crops. The black panther is and alternative name for the leopard, used for the black individuals that occur sporadically, but are more common in southeast Asia. The rosette pattern can be seen on black leopards in proper light. The black leopard is the result of a recessive gene. Black parents will have black young and it is possible for spotted parents to have black young. Litters may even be mixed. 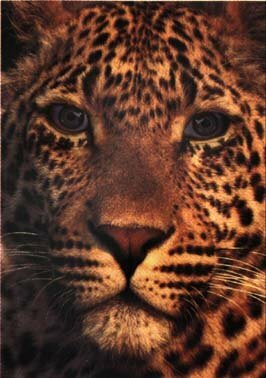 Originally, it was thought that a leopard was a hybrid between a lion and a panther, and the leopard's common name derives from this belief; leo is the greek and latin word for lion (greek leon) and pard is an old term meaning "panther. In fact, a "panther" can be any of several species of large felid. 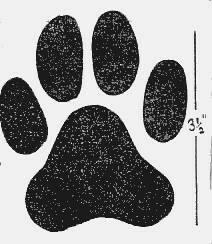 In North America panther means puma and in South America a panther is a jaguar. Elsewhere in the world a panther is a leopard. Early naturalists distinguished between leopards and panthers not by color (a common misconception), but by the length of the tail - panthers having longer tails than pards (leopards). The range of the leopard`s hearing is twice that of a humans,and in dim light its sight is six times better. The leopard likes to drink daily but can go for as long as a month without water. Leopards have highly developed homing instinct.A group found wandering in a Suburb of Nairobi was captured and released in the Tsavo National Park, 200 miles away.Within a few weeks,the leopards found their way back to Nairobi. On average Leopards with its powerful jaws can carry an Animal weighing as much as 500 lb kill and is able to climb a tree dragging a 250 lb kill in its teeth.They have the strongest bite force Of all the large cats.